Party Casino has changed its bonus code entry format in recent years to make it less cumbersome for players to claim bonuses. However, players will still need to enter a corresponding code in certain cases in order to receive bonuses. 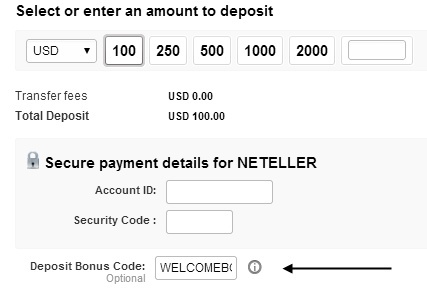 A screenshot is provided above that shows where the player will need to enter a bonus when making a real money deposit. The actual code depends on the specific bonus being requested. There is basically one main bonus that Party Casino offers to its players. The Welcome Bonus requires the player to enter the bonus code manually whenever making his or her first deposit at Party Casino. There is a 30-day time limit from the time the bonus is received to clear it. If it is not cleared by that time, the bonus amount will be lost. The Welcome Bonus is available for new players at Party Casino. Upon making your first real money deposit, enter the code WELCOMEBONUS (no spaces) in the slot that says “Deposit Bonus Code” and your account will immediately be credited with the corresponding funds. The minimum deposit amount to acquire this bonus is $10. Note that any play on Bonus Pairs Blackjack, Texas Hold’em Bonus Poker or low-risk roulette bets won’t contribute at all to clearing your bonus. The bonus is available in GBP and EUR in addition to USD. The maximum amount of the bonus is 100 currency units in either case. Instead of earning out 1 point per dollar of the bonus, you’ll instead have to collect 1.1 points per euro or 1.3 points per pound of your (deposit + bonus) total. Until the bonus is fully earned out, you’ll be restricted to a maximum bet size of $10 per round on slots or jackpot slots and $50 per round on other games.